It will take up to five years to control the latest outbreak of rabies in the Hamilton and surrounding area, say Ontario ministry of natural resources staff. Starting in April the MNR will begin a spring baiting program that will involve a 50-km radius from the Hamilton area, the epicenter of the December rabies outbreak, said Sarah Fraser, wildlife researcher from the MNR’s Guelph office. Fraser told about 25 people who attended the Stoney Creek Municipal Service Centre April 13 for a second information meeting held about rabies by the MNR, the baiting program will be using a helicopter and airplane flying over the area that stretches from west of Toronto, to Kitchener-Waterloo, and Long Point. Hand-baiting will also be done in the Burlington area, she said. Since December, there have been 21 rabies cases in Glanbrook, 12 in lower east Hamilton, 10 in Ancaster, and lower Stoney Creek and central Mountain has seen seven cases each. Overall, Fraser said the MNR has tested 2,200 animals in southern Ontario since December. The MNR believed raccoon rabies had been eradicated in the area in 2005 after two years without rabies. But with the mild winter and the ongoing battle in the United States against rabies, it was only a matter of time before rabies entered through Niagara or the eastern part of Ontario. “Despite our best efforts with the buffer, it jumped over,” said Fraser. 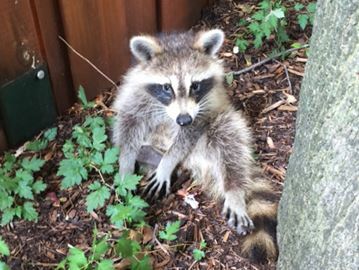 By Dec. 8 three more cases of raccoon rabies were discovered in Hamilton. The MNR went into action and began hand-baiting and dropping baits from a helicopter. By Dec. 11 when another case of rabies was found in Haldimand the MNR was using a twin Otter plane to drop more bait to control rabies. From Dec. 7 to Dec. 23 220,000 baits – contained in a package that raccoons eat – were dropped. Fraser said the December baiting program was “brand new” due to the severity of the rabies outbreak. She said after the spring baiting program, the MNR in June will capture 580 raccoons to test for rabies, and later in the summer another baiting program will begin. Public Health officials urged the crowd who came from as far away as Welland and Cayuga, composed mostly of trappers and people involved in handing raccoons, skunks and other mammals, to get pre-exposure rabies vaccines. The $600 cost for three shots isn’t covered by Ontario Health Insurance, but it is tax deductible. “You should look at pre-exposure,” said Connie DeBenedet, vector borne disease specialist for the city of Hamilton’s public health services. DeBenedet urged the trappers to not only get the vaccine, but also to cover up and use gloves when working with animals. She said people must report to the city if they get a bit or are scratched by an animal. As soon as possible, wash the wounded area with warm soapy water, then call a doctor or go to the hospital. She urged people bitten or seeking more information to call public health at 905-546-2489, including after hours. “Rabies is the deadliest disease on earth,” she said with a 99.9 per cent fatality rate. But rabies is 100 per cent preventable, said DeBenedet. DeBenedet said health care personnel will contact the local public health official to get a rabies injection of immunoglobulin for the person wounded that is injected around the bite area, and a second injection of rabies injection into another part of the body. A person can become infected by rabies if the bodily fluids (saliva, and nervous system tissues) of an infected mammal. MNR and public health officials also urge the public to report any animals acting strange so they can be tested. The last Canadian to die due to rabies was in Alberta in 2007, which was the 27th death since 1925 of rabies. Worldwide, 60,000 people die of rabies. In the United States, there are up to three deaths per year. DeBenedet and MNR officials said they will be discussing what trappers should be doing with the bodies of animals they have skinned. If the bodies are left, the virus remains in the body and will be passed on to another animal when eaten. If frozen, the virus will remain in the body. Trappers usually just burn the bodies. “That is something we should look at,” said DeBenedet.